More new wire godseyes and godseye affirmation holders coming soon. I will be adding a variety of one of a kind painted wire baskets. They are brush painted so kind of a nice distressed look. I am using oil paint so it is very long lasting and durable. Free domestic shipping on the new cactus garland for a limited time. 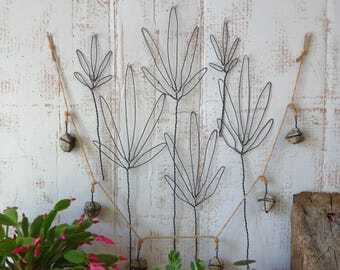 They are over 6 feet long and have 6 handmade hammered wire cactus ornaments. New woven lamp in a shadow bow wall unit. After making the cactus ornaments I decided to give a 3d cactus a try. This one is going to a local shop but I plan to add them to my etsy soon. Also the cactus ornament garland is coming soon. New table baskets coming soon. I will have small ones like this and also a very large version as a table centerpiece basket soon. Free shipping all weekend on the small sphere basket until 3/13. There are all kinds of ways to fill these little woven sphere baskets. I giving away one of these birds with each order now through 9/27/2016 as,a,thank you. It is the same bird that is in my folk art garland. The woven table basket can also look great on the wall. 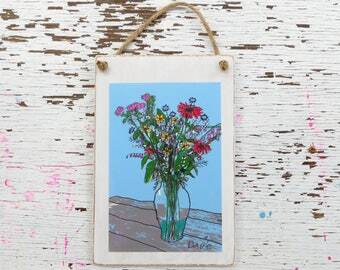 By itself or used to display decor items it has a great rustic country charm. The sphere set will soon be offered with custom hangers like these. 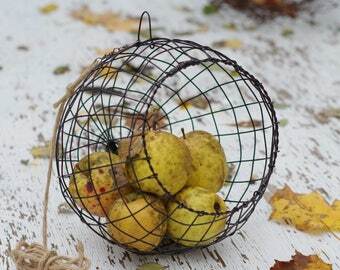 The small wall sphere basket is great for a few fruit or vegetables but also can be used many different ways as a decorative piece. Custom wall sphere in distressed blue. New custom order wire sheep. I am happy to do custom order requests. Made this custom basket for a customer who wanted something bigger than the standard size. 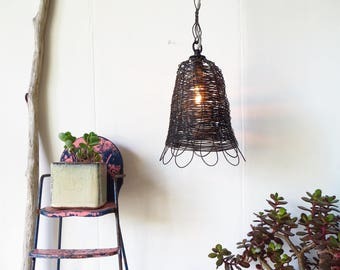 It is larger and features a twisted double wire hanger and rim. The boho papermache cactus are coming soon. 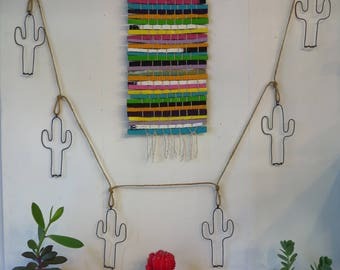 I will also have more wire cactus as well. Wire photo frames and wire framed mirrors are coming and I have a couple in the shop now! Just listed my latest and largest wire God's eye sculpture. Just listed this fun little collage. The current God's eye collection. I have a couple listed in my shop now and will be adding more. Made some upgrades to this great handmade wire winetote. It now features a double wire twisted rim, a triple wire twisted handle and 2 coats of flat black enamel paint. It great for carrying wine, as a wine display or a a great hostess gift. Some new cactus sculptures. I will have some of these in the shop soon. 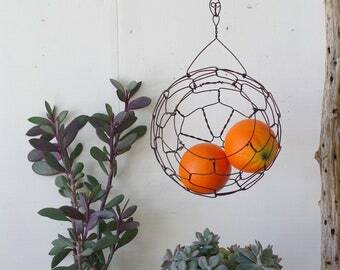 This wall sphere basket now comes woth a nice little loop at the top to make it easy for hanging. Another new framed 4x4 print from my original digital painting "love sheep". Great item for collectors as I will be adding many more of these and I think they look great by themselves or in a grouping. New framed 4x4 prints in the shop. I will be adding more framed prints of my paintings and digital paintings. I just put this one up. A new version of the wall sphere. This one is hand woven. Will be available soon. Close up of this painting.